The Schwinn Airdyne Evo Comp exercise bike is a great bike that is a smaller and quieter version of the original AirDyne. The computer on the LCD console tracks 7 functions including time, speed, distance, calories, RPMs, heart rate, and workload level. It comes with 2 workout programs. The console operates on 2 AA batteries. UPDATE: The AirDyne Evo Comp is no longer available. Check out the very popular new AD6 model, an upgraded version of the Evo. 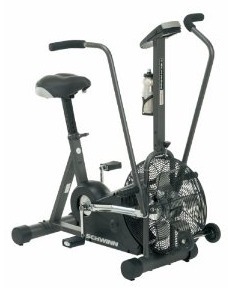 The Schwinn Airdyne Evo Comp exercise bike has a smaller fan wheel than the original Airdyne. 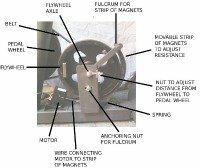 It uses a dual-stage chain and belt drive design with a spring-loaded chain tensioner, and a friction-free braking system that requires less maintenance. The sealed cartridge bearings provide a smooth pedaling action and the padded seat provides good support for the sit bones. The Air Resistance Technology and fan flywheel gives an infinite amount of resistance. You can pedal slowly with no resistance, or speed up and pedal as fast as you can while the air resistance increases exponentially – until you’ve reached a heart-pounding, lung-bursting level of exertion. With an AirDyne bike, there is no tension dial to set, you just pedal faster or slower and set your own workout. 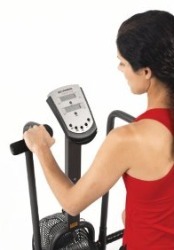 As an added bonus, the fan generates wind that blows back on the user, keeping you cool throughout the workout. The integrated workout handles can be used as you pedal in a synchronized motion, or you can place your feet on the foot pegs and push/pull the handles for an intense upper body and core workout. This model also includes a telemetric heart rate monitoring capability though the chest strap is not included. 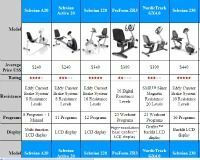 Note: The assembly “booklet” included with the Schwinn Airdyne Evo Comp exercise bike is poorly written but you can download a better set from Schwinn Fitness. Plus you will need to supply your own tools. You will need several metric wrenches (14, 15, and 17mm), a screwdriver, and a couple of standard wrenches (1/2" & 7/8"). There is no question that the Schwinn Airdyne Evo Comp is a great exercise bike and gets stellar reviews – but don’t buy one unless you can have it assembled by a pro bike technician, or you have a lot of patience and are good with challenging projects. This is one of the more difficult home exercise products to put together (many parts, numerous nuts and bolts of various sizes, tools not included, instructions written by aliens, etc.). We can’t stress this enough: the only bad reviews this Evo Comp receives are from frustrated users who could not put their bikes together and didn’t own a set of wrenches. Otherwise ... it really is a great bike that earns its positive reviews. But if you don’t want the headache of putting this bike together, check out the new AD2 Airdyne – which comes mostly pre-assembled and sells for half the price of the Schwinn Airdyne Evo Comp exercise bike.